Honolulu City Lights Sunset Dinner Cruise for two (2) for less than half price!! Honolulu City Lights Sunset Dinner Sail Get ready for an incredible evening on a dinner sail like no other. 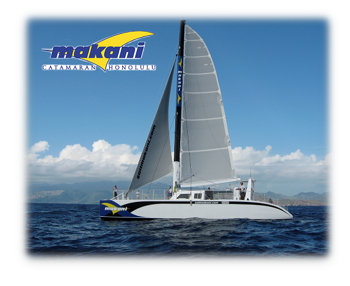 Escape the stuffy dining room and enjoy the open air on a sunset sail with Makani Catamaran! As an amber glimmer of the setting sun reflects off the city skyline and the towering peak of Oahu’s famed Diamond Head stands above the azure water, you’ll be reminded why you came to Hawaii in the first place… To discover the beauty of paradise! Featuring a delicious island-style dinner buffet, indoor and outdoor seating, and a stunningly beautiful Hawaiian sunset, there’s no better way to bring an end to a day in the tropics than on an evening sail with Makani! Makani, the finest Hawaii catamaran offers a covered cabin seating area, two large, freshwater restrooms, Bose surround sound system, LCD TV, sunbathing net areas, and pilothouse seating. No expense has been spared making Makani the catamaran of choice for the most discriminating customers, including many celebrities. The Captain and crew will attend to your every need. We hope you will make Makani your first choice to “Feel the Thrill” and have an unforgettable Hawaiian ocean experience. Reservations required - please call 808-591-9000 to book your reservation, based on space and availability.